This past week in #CPChatNow members took a page from the Baseball Hall of Fame and inducted members into a mythical Cerebral Palsy Hall of Fame. Members also talked about parenting strategies for kids with CP and positive things that have happened this week. 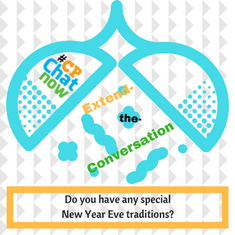 This is #CPChatNow Co-Host, Devin Axtman, taking you along on this week’s recap. All aboard! Next, talk turned to a video with Zach Anner, a comedian with CP, where Zach offers his parenting advice for parents of children with CP. Zach then took inspiration from the Baseball Hall of Fame’s announcement and asked members who they would like to see in a CP Hall of Fame. 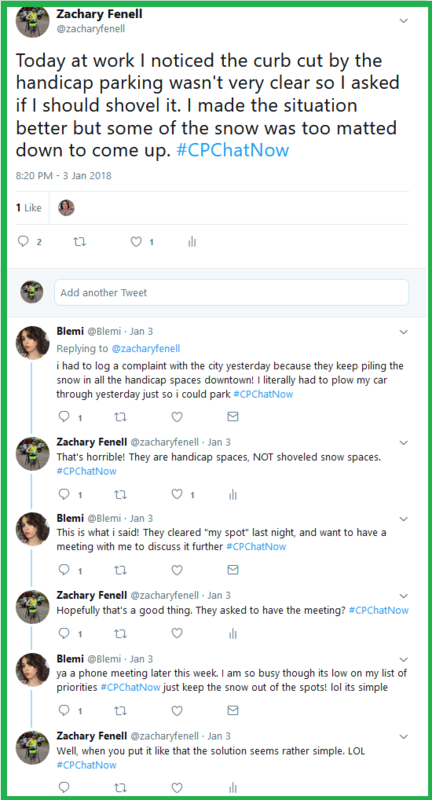 Members mentioned various people including Geri Jewell, Christopher Nolan, and Maysoon Zayid as well as things like #CPChatNow. This brings us to our Extend-The-Conversation question: What tips do you have for parents of children with CP? 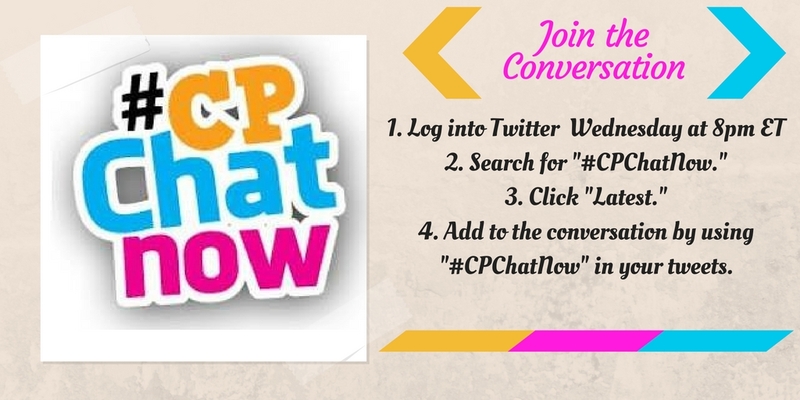 Please answer in the comments and join us on Twitter at #CPChatNow every Wednesday at 8pm ET. 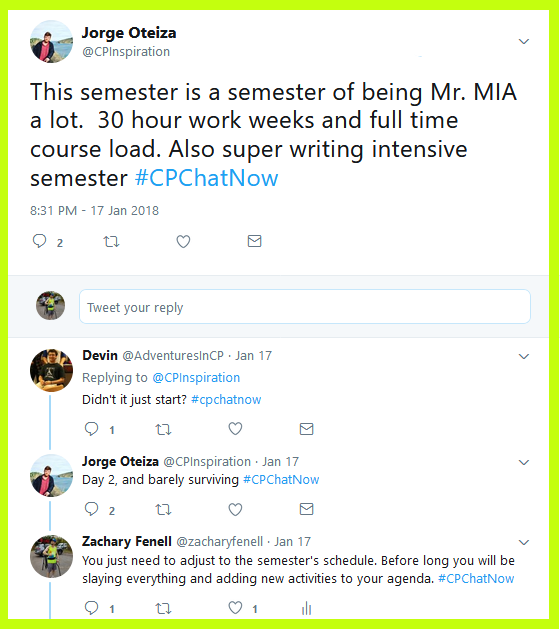 Members in the #CPChatNow community turned to our Twitter chat Wednesday, January 17th, 2018 seemingly looking for an escape from their busy lives. I am co-host Zachary Fenell, here to tell you more. There seems no better way to do that than your weekly recap! A theme involving busyness quickly emerged. Co-host Jorge Otezia dropped in, updating us on his semester ahead at University of Mary Washington. Between working 30 hours a week and a full course load Jorge warns he will end up missing in action a lot. In a separate conversation my other co-host Devin also appeared occupied with a full schedule. Responding to Devin, I pointed out how busyness can tempt someone to feel overwhelmed. Personally I avoid this by remembering busyness proves a privilege. Changing your mindset to say “I get to” oppose to “I have to” makes a huge difference! Otherwise you risk becoming stressed. 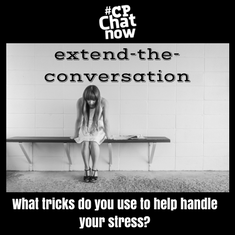 Fittingly stress surfaced as a topic thanks to #CPChatNow regular Rachel. 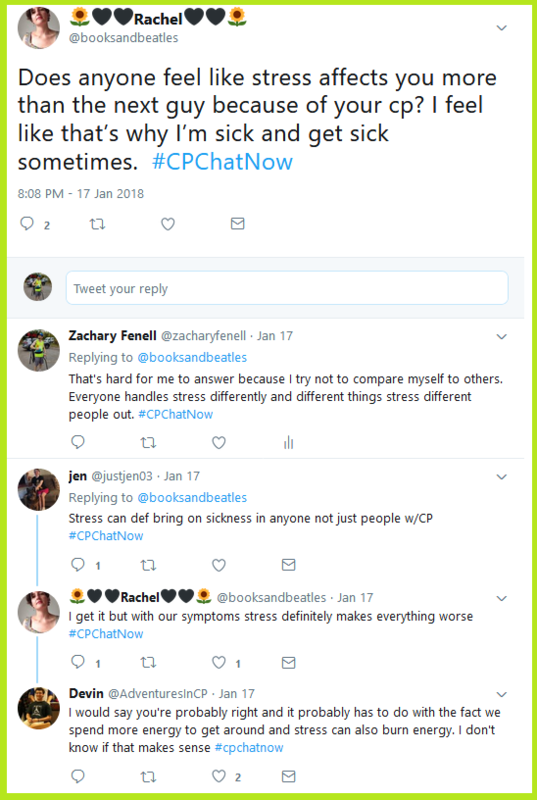 Rachel asked if anybody feels like their CP makes dealing with stress harder compared to our able-bodied counterparts. Among the replies to Rachel, Devin offered an interesting theory. He theorized since we spend more energy moving around, we also exert more energy when stressed. To prevent dwelling on the above problem, let us borrow the approach #CPChatNow co-founder John W. Quinn shared so many times. John always encouraged we focus on solutions. So answer as the week’s extend-the-conversation question, “What tricks do you use to help handle your stress?” Leave your stress relief tip via a comment in the “Comments” section. Before commenting though, shall we continue with the recap? Conversation eventually transitioned to a couple recent news stories. The first caught my attention earlier in the week. 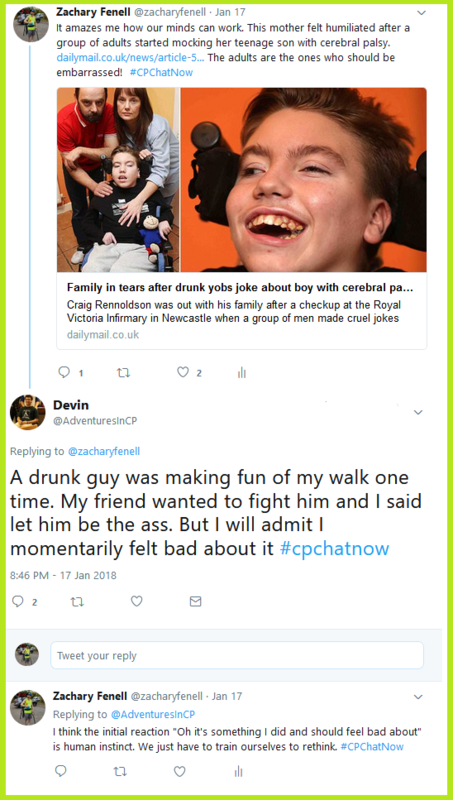 The story “Family of boy, 13, who cannot walk or talk because of cerebral palsy left in tears after laughing drunks call him a ‘cabbage.‘” noted how the mother felt humiliated by the experience. Reading her comments saddened me because in my opinion the offending adults should feel embarrassed. Not the family! Devin shared enduring a similar situation and initially feeling bad. I deducted feeling bad stands a human instinct, but we could benefit training ourselves to rethink our emotional response. Beyond his own memories Devin tweeted about another news story featuring bullying behavior. Devin’s share “Professor put on leave after allegedly mocking U of G student with ‘severe anxiety’” detailed a professor who allegedly acted unsavory towards a student with severe anxiety. Rachel found the article unsurprising. Meanwhile I contemplated contributing the bullying behavior to the professor possessing his own unresolved issues. Anyways, enough negative talk! Time to find solutions in life. We cannot control other people, but we can control how we react in such stressful situations. Perhaps you enjoy a great stress relief tip. Share by answering the week’s extend-the-conversation question. Respond below. Until next time remember, don’t blend in. Blend out! 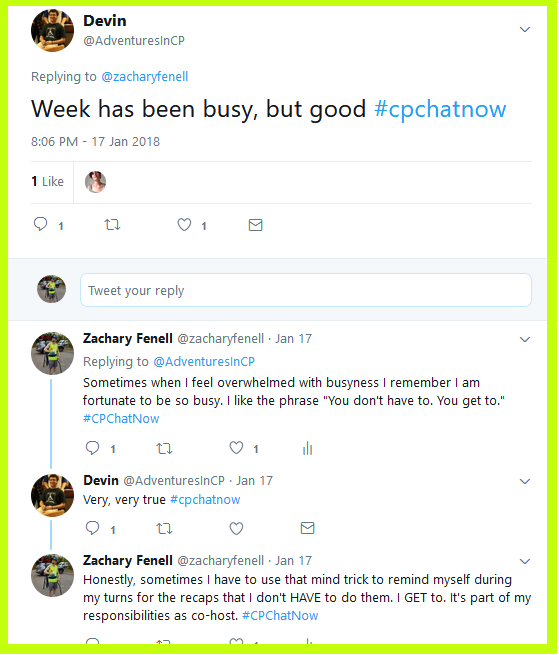 This past week in #CPChatNow was eventful as always. Members discussed the benefits of warmer weather, frustrations about obtaining a new doctor, and the lift that an unexpected gift from a friend can offer. 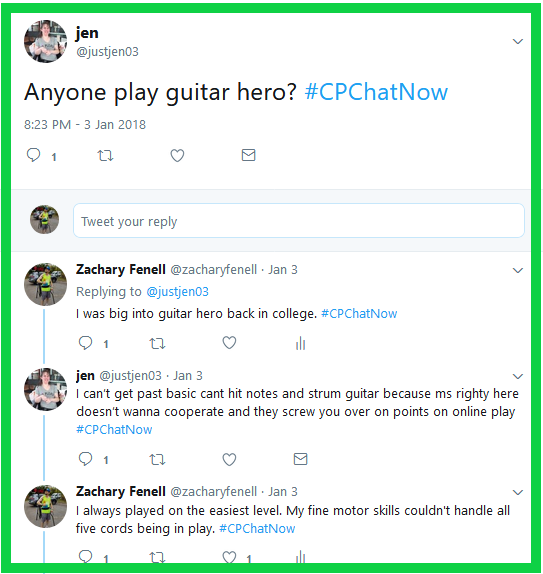 This is #CPChatNow Co-Host, Devin Axtman, taking you along on this week’s recap. This brings us to our extend-The-conversation question: What is an example of a friend doing a helpful thing you did not expect? 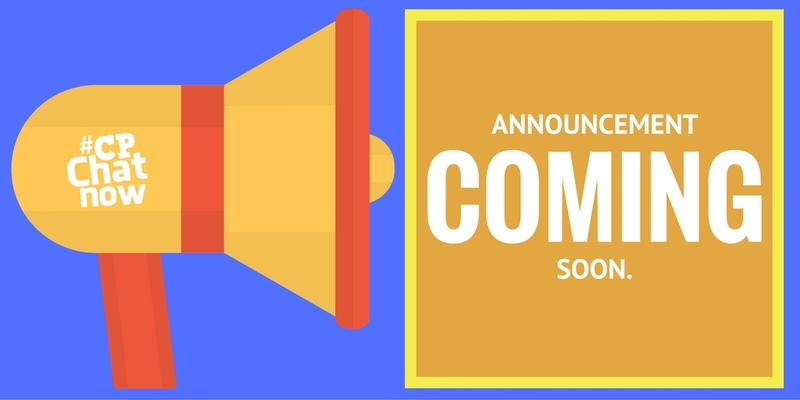 Be sure to join us each Wednesday on Twitter at 8 Eastern time for more fun! Happy New Year! 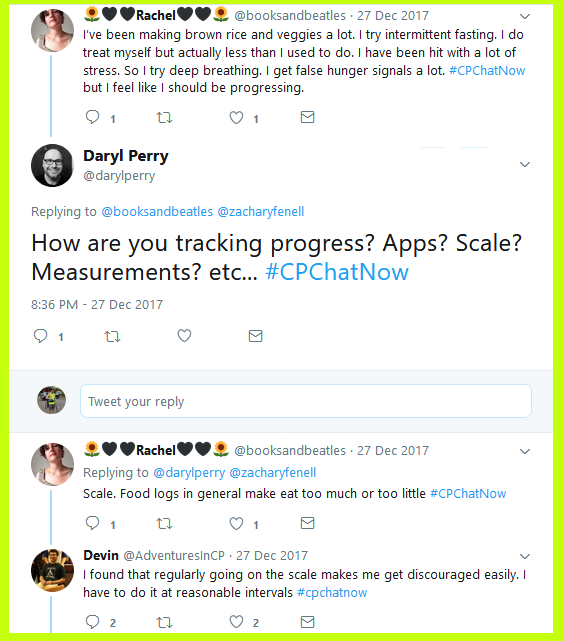 We in the #CPChatNow community prepared for the occasion Wednesday, December 27th, 2017 when we welcomed guest Daryl Perry to lead our “Setting Good New Year Resolutions” focus chat. I am co-host Zachary Fenell and you likely know my intentions. 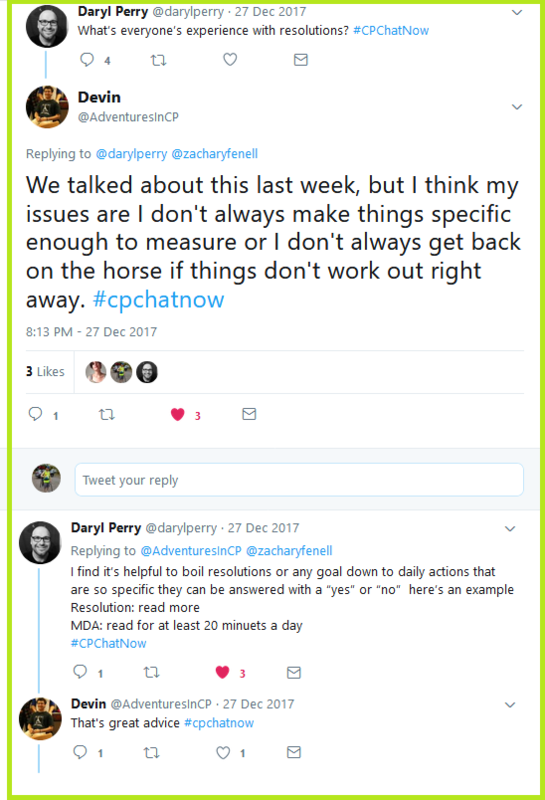 To summarize the dialogue from December 27th, 2017 into your weekly recap! First, I realize I am a week-and-a-half late in posting this. I am sorry. Actions always speak louder than words, though. 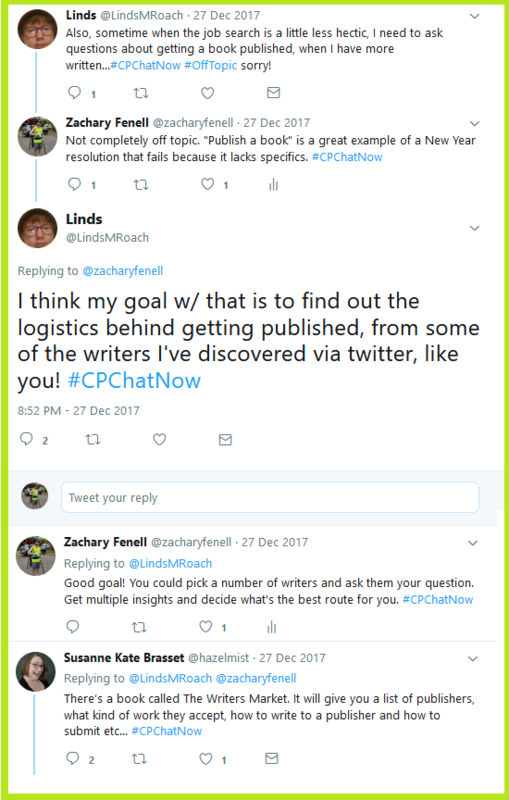 Therefore let me set a New Year resolution to stop the last minute and worse, late, #CPChatNow recaps. After today I resolve to bring you recaps at the latest 24 hours prior to the next chat. Sounds good, right? Nevertheless achieving New Year resolutions can prove extremely challenging, if not seemingly impossible! Enter the reason we ended 2017 with Daryl. As an experienced small businessman (Your Level Fitness) and personal trainer Daryl maintains insights helpful towards enabling our community to set attainable New Year resolutions. Daryl began the dialogue by asking participants to share their past experiences with resolutions. 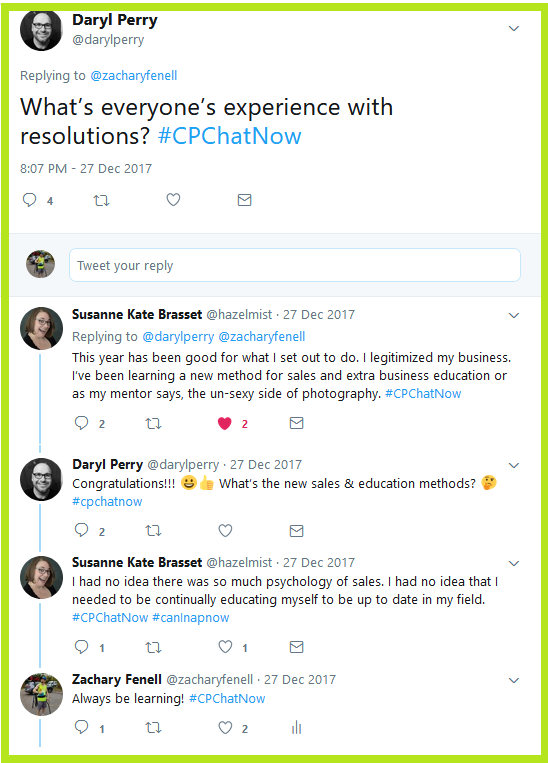 Susanne Kate Brasset announced victory with the resolutions she set in 2017, mainly involving legitimizing her photography business. Others lacked the same triumphant tales. Both regular Linds and my co-host Devin pinpointed where their New Year resolutions usually stray. Devin acknowledged difficulty with setting measurable goals and also dying motivation upon results failing to surface right away. Similarly Linds noted failed attempts at weight loss. 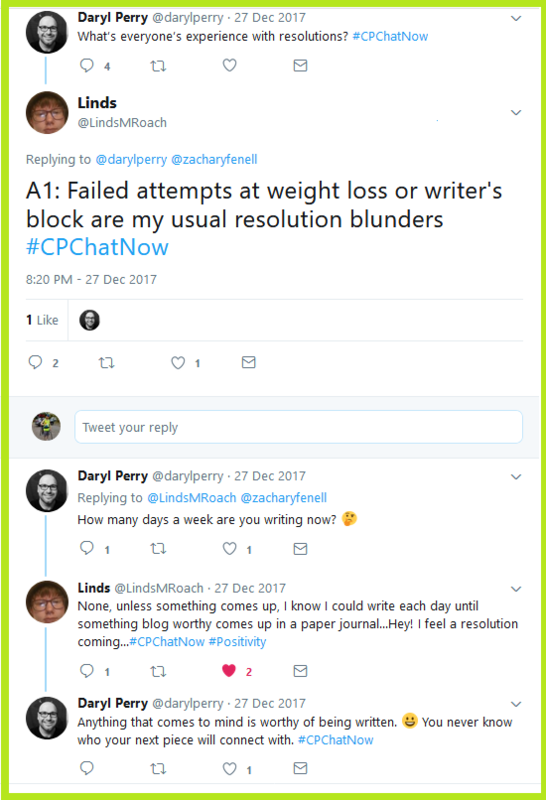 Meanwhile Daryl responded to Linds by seeking to understand her writing habits. His questioning left Linds feeling a New Year resolution surfacing, “write each day.” Related to the writing theme, Linds brainstormed resolutions which could aid her goal to become a published author. Particularly Linds pondered seeking knowledge from already published authors. Susanne suggested another resource too, the book The Writers Market. Further chatter about writing resources progressed alongside other topics. Like Linds earlier, Rachel expressed struggles with weight loss. Rachel named specific obstacles to weight loss that cerebral palsy causes, i.e. developmental problems and how the body handles stress. 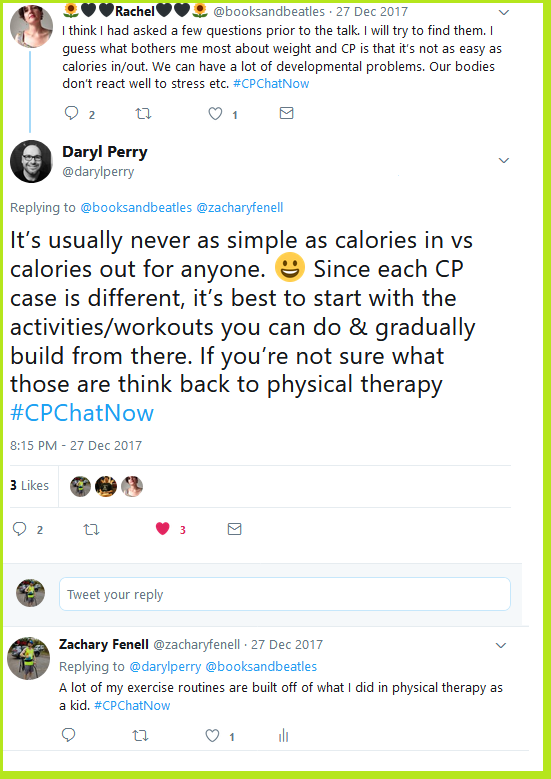 Replying, Daryl emphasized the individualistic nature behind each CP case and recommended focusing on activities and workouts you can do. Nonetheless due to cerebral palsy completing said activities and workouts year round represents another obstacle. Rachel noted the ways winter messes with our muscles. 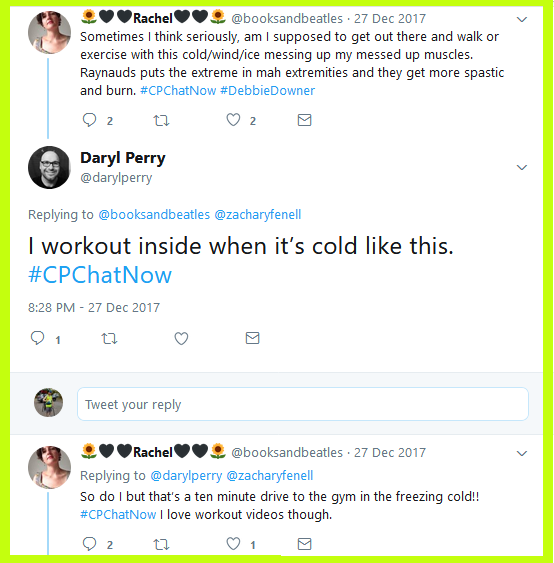 Elements Daryl attempts to minimize through working out indoors during winter. However, Rachel noted you cannot completely eliminate the cold, snow, ice, and such. After all you must drive or find transportation to the gym. 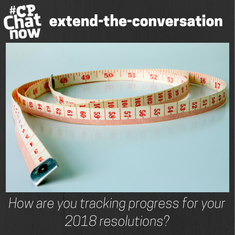 Eventually the weight loss conversation turned to tracking progress. 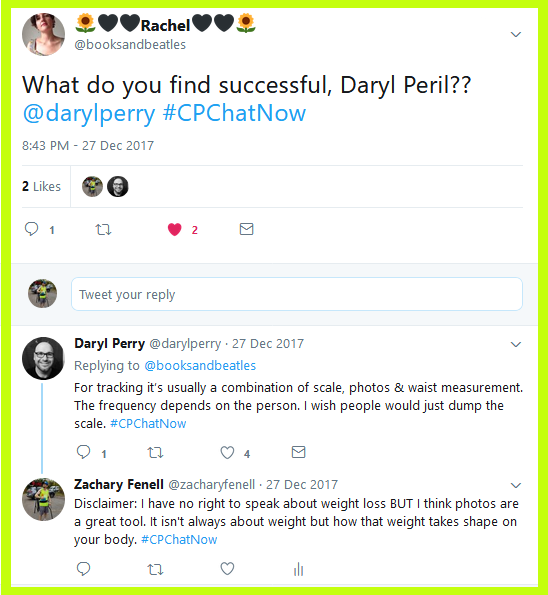 Following Rachel listing weight loss techniques she tried, Daryl inquired about how she measures her progress. She explained her preference to use the scale over food logs. Devin additionally chimed in, saying weighing himself regularly winds up creating discouragement. Leave your response in the “Comments” section. 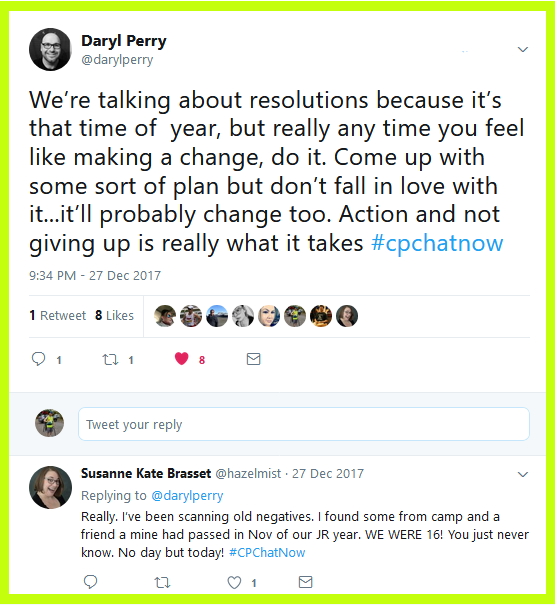 Remember as Daryl reminded everyone to end the “Setting Good New Year Resolutions” focus chat, you can resolve to make a change any time. 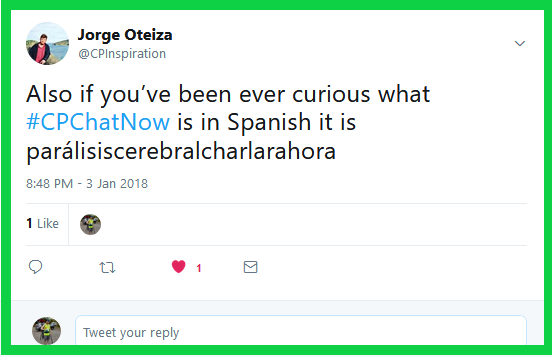 You do not need to wait!